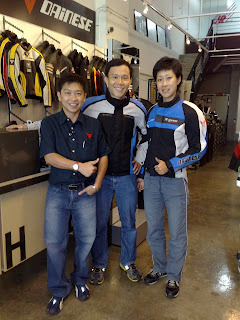 Ros and Seung Adventures: Dainese - Riding Gear for Safety! It's been a couple of months in the discussion, and finally Peter from JR Pte Ltd had come into the support for Enduro Africa! They have gladly given us Dainese riding apparels for the trip and being bikers, we had a good chat about biking and how to make it a lifelong passion! Peter owns a limited edition R1 with Ohlins & Marchesini goodies! A FAR cry from the 10 year old CBR600 that we have!!! So now you know WHO'S THE DADDY!